Bootstrap has been on the web for several years now. Being a responsive design framework that can be used to build either static and dynamic web applications or websites, it has gained so much popularity in Github and has been a really helpful tool for Web Designers and Developers to build amazing responsive websites in no time. Due to it’s easy to use classes and module based framework, it has made the life of Developers a lot easier as they can easily code less using different standard modern designs. In this three part series tutorial, we’re going to look at in-depth tutorial on how to work with Bootstrap and how customize it for different designs. Before we continue digging more about Bootstrap let’s look on some of the best portfolio websites made with Bootstrap. Here are just some of them. 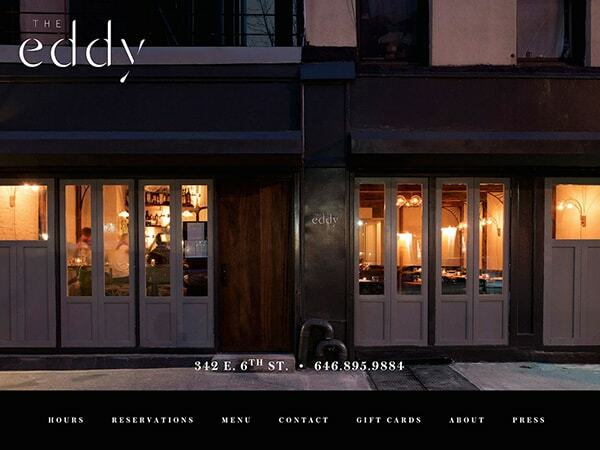 The Eddy is new to the East Village, opened for business since April 2014. The site was built with a simple flat design and minimal colors using Bootstrap framework. 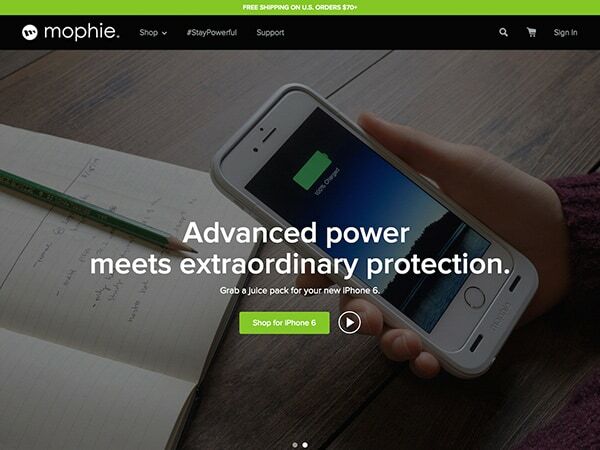 Mophie is the best known iPhone battery case maker that also offers universal power station line that is compatible with almost any USB device. Their site was built using a modern big slider and flat colors along with the bootstrap’s module framework design. What’s new with Bootstrap 3.3? After some bugs fixed and improvements made, Bootstrap has come to its third version. The following are some of the new features in this new version. 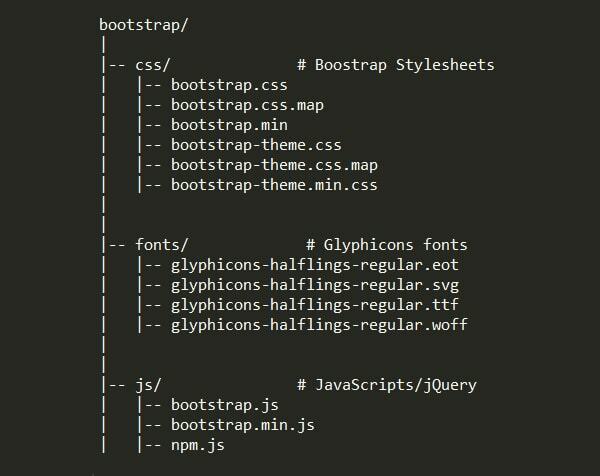 To start off, we need to download bootstrap.zip from the official website of Bootstrap. But before we move on, it is worth talking about customization feature that we can do on our bootstrap package. To do this, just click the “Customize” button on the top menu of the Bootstrap official website. This way you can customize what you want to include on your download with your Bootstrap package including LESS and other jQuery plugins. For the sake of this tutorial, I am going to include everything and just download the default Bootstrap package. At the time of this tutorial, we have the Bootstrap version 3.3.2.
bootstrap-theme.css – this CSS file contains extended styles such as 3D buttons, gradients and so on. Similar with the regular bootstrap.css file this is the larger file version of this file. 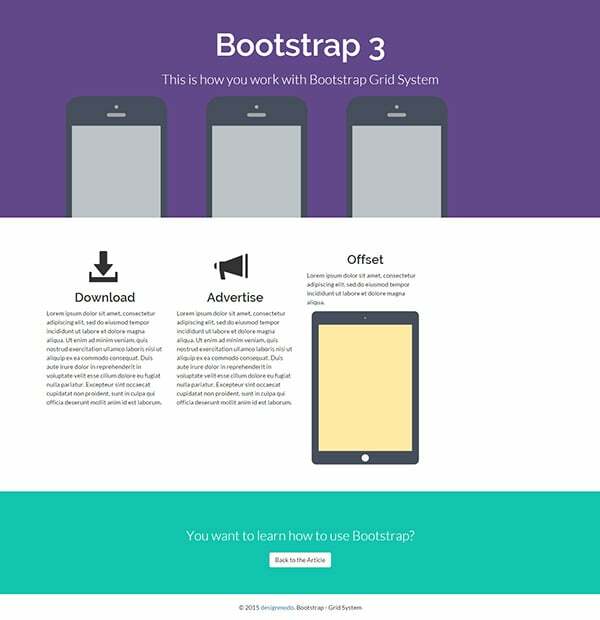 bootstrap-theme.min.css – this is the minified version of the bootstrap-theme.css file. css.map and bootstrap-theme.css.map – these are source maps generated by LESS. The main purpose of these map files is used to link the CSS source code to LESS source code in developer’s tool such as those in Firefox and Chrome. html – this will serve as our main file. All of our designs will be utilized on this file. Although Bootstrap 2 added an optional mobile friendly CSS to its framework, Bootstrap 3 has a 12 column grid system on its package with its “Mobile First” approach which means everything has been redesigned for mobile device screen sizes first scaling up to the larger screens afterwards. It comes with four grid sizes that breakdown each sizes. Check out the media queries below. To expand the max-width that limits sizes of devices, Bootstrap used the following media queries. 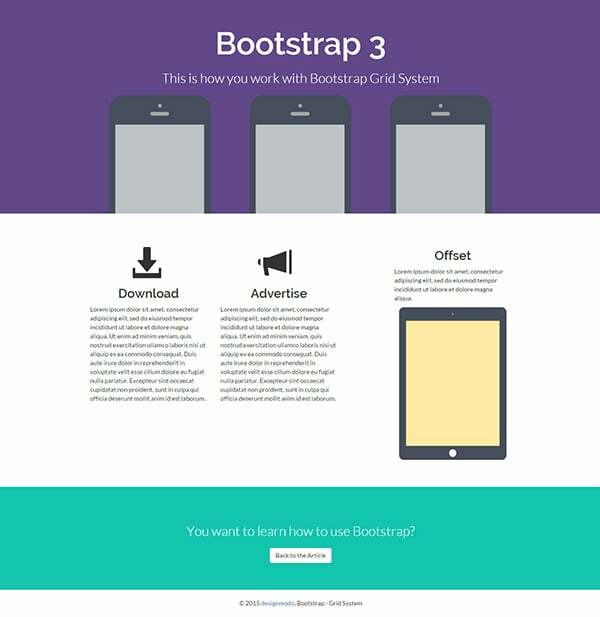 For more information visit bootstrap CSS page. Before we use these available classes for our grid, we need to set up a wrapper on our site which is the “container” and “row” class in order. See example below. Note: With “fluid” class attached inside the container class it will set up the container in a full width mode spanning the entire viewport’s width. You can also place another classes along with the first grid class you set if you want to control what will appear on specific viewport size. As an example, if you want to make your 2 columns floated left and right on smaller devices you can place col-sm-6 along with your col-md-4 class. See example below. Now that we know how we can use the basic grid classes, let’s now apply it on our real world example. Below is our set up for our columns and grids. As you can see on our codes we’ve set up multiple rows with three containers. Inside of each row contains header tags, images and so on with their respective grid sizes. Notice that we’ve used two classes on each grid sizes to control the layout we want on different sizes. Now let’s add some custom CSS to override and fix some default styles given by Bootstrap. With these codes you’ll get similar result like the image below. The next thing we need to look on is the bootstrap’s offset features where in we can set up spaces between columns. If you’re going to look on our output layout so far you’ll see that the the three iphones are place close enough to the left side of our screen. Another thing is the download and advertise box underneath as there are no space with the offset box. To create spaces here we’re going to use the offset class along with our grid classes. Our syntax code will be like this: col-gridsize-offset-number-of-columns. Let’s say we want to set up an offset-2 this means that were going to create an offset of 2 columns to push the column to our desired place on the screen. Please take note that the offset is always added to the left side and needs to be balance with the current grid sizes set up on all of the columns to have 12 grid columns in a row. Now to apply this on our iphone sizes as well as the download, advertise and offset box, check out the codes below. In above codes, we’ve set up an offset of one column to the iphone rows and download column to create spaces. Check out the output image below. Using our markup example, you’ll notice that the offset box is on right side of the screen and when the screen size gets smaller it will first display the other two boxes which is the download and advertise box that were place on the left side column. But what if we want to display the offset box first without messing up with the order? col-grid-size-push-number-of-column – push the column to the right by the number of columns, starting from where the column would normally render. col-grid-size-pull-number-of-column – pull the column to the left by the number of columns, starting from where the column would normally render. Ok let’s put this into action. From the codes above I change the location of the offset box and place at the top of the other 2 columns. Next, I set up a push of 8 columns to the offset box and then set a pull of 6 columns to the advertise box. By this time it will just align the boxes properly but will display the offset box first on smaller viewports. Bootstrap allows nesting of rows. These means you can add a row within a row and set some grid sizes on it. The good thing about this is that it’s not required that you use all 12 available columns. On our markup let’s nest some rows and see how it works. As you can see, we’ve nested some rows on our codes using 6 column grid sizes. So if you’re going to look on our codes, you’ll something like this. Great! Now that we’ve learned the basics of Bootstrap’s grid system you can experiment more on your own and explore what’s possible to do with it. I would recommend you to always check the bootstrap documentation for more information about the classes. On the next part of this tutorial series we’re going to work on CSS overview. So stay in touch with us and subscribe to our newsletter if you don’t want to miss the next tutorial. Can’t wait for the next part of this!